A 16-megapixel Sony Exmor RS IMX240 sensor with extremely wide, f/1.9 lens and optical image stabilization – now who wouldn't get behind such a camera? We've already formed a first impression (a good one) of the unit, and though we'll continue sharing with you those insights for as long as we're here in Barcelona, do keep in mind that it's too early to tell if the Galaxy S6/S6 edge will outperform the competition. 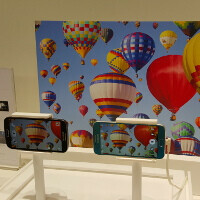 Regardless of all of that, we went to Samsung's booth once again to snap a few more samples with it. The area outside of is strictly off limits when you have one of Samsung's darlings, but we did get a few fine shots nevertheless. Health warning: Full-sized camera samples, will take a while to display depending on your connection. Respect from iPhone fan boy !!! Simply Fantastic images \m/ wat abt low light ? its crazy the 3 pic you can even read the names on the girls tags. and i got to say i was all about the black sapphire but that emerald green is sticking to me. Shot # 8 is my fav.. Only thing I wish was that if the security guard was not in the frame, would have been perfect composition. Photos look great on pre-release software. Can't wait to see the final build on roll out. Definitely things will get better with the final software. It looks very promising so far, they just need to tweak that yellowish tint found on some pictures. The best thing about the camera is the 16:9 default aspect. That's a negative, 4:3 or 3:2 is the way to go. Hey PhoneArena: do a M9 vs S6 photo comparison. I know none of them are in final firmware, but just to get an idea how things are shaping up. Can't physically get them together, since they're all chained to their respective booths. No, credit goes to Samsung for their superior camera software. Only the sensor is Sony. The 6-element F1.9 lens, OIS and software is Samsung's. That's why Sony can't make a decent Snapper. Only sensor can't do anything. Sony fan here...not a fanboy...but your statement is kinda funny...not true! 16:9 is actually a good thing. My TV, desktop, laptop and phone all is 16:9. And you can always use the cropped 12 MP mode. But the thing is that the field of view in this 16:9 sensor is a lot smaller than in 4:3 sensors. A LOT smaller. It's so annoying when I take pictures and I cannot fit the whole scnene in the picture. Even all of the "real" cameras use 4:3. IDK about that. A 16:9 can have wider FoV. What's the mm equivalent of S6's camera? Yes, 16:9 default at 16MP. You also have 12MP (4:3), 8MP (4:3), 6MP (16:9). You can easily worj with 12/8MP if you like, enough resolution for most work. Infact, this should reduce noise further on pixel-level. Won't reduce noise, because you're not getting a full sensor read-out, you've just turning off pixels. If you built the sensor to have less pixels on the same surface, then noise is reduced. And here I am just wondering why they don't use a f/1.8 aperture? Or the Note 5 perhaps!